When it's go time for a glam look, there's no better option than tall girl dresses and skirts. With extra length from top to bottom, junior dresses in tall sizes will give you a great fit no matter what the occasion. Just take a look through the stores in my tall girl dresses and skirts directory. You'll find plenty of cheap and inexpensive styles in a wide variety of cute, trendy fashions, including strapless, knee-length, maxi dress, and sundress. So, whether you're headed out on a formal first date or just wanting to look casual and pretty while hanging with your girls, these juniors dresses have got you perfectly covered. TALL TIP: Alloy Apparel is offering Free Shipping on orders over $85. Find jeans and pants in up to 39" inseams plus tall tops, dresses, and coats! Alloy Apparel ($) Inexpensive and cheap juniors clothing store. Tall girls jeans and pants in 35", 37", and 39" inseams. Also offers tall juniors dresses and skirts in extended lengths. Select the Tall Shop to view all tall clothes. Plus sizes available. eShakti.com ($$) Select from a wide variety of dresses, tops, skirts, and jackets and customize according to your own measurements. You can also tweak the styling based on your preferences such as sleeve length, collar style, and overall length. Gap ($$) Variety of long size jeans and pants in up to 37" inseams with select styles in 38" inseams. Also offers popular styles of junior dresses, skirts, tops, tees, tanks, blouses, sweaters, coats, and jackets in tall sizes. Select the Women's Tall option to view all tall clothing. Shop online or at retail locations. Long Tall Sally ($$) Specializes in clothes for tall women. Tall jeans and pants in 34" to 38" inseams. Also offers women's tall clothing such as tops, sweaters, dresses, skirts, suits, coats, activewear, sleepwear, and swimwear. Extended sizes available. Shop online or at retail locations. Based in the U.K. Also in the U.S. and Canada. New Look ($) Inexpensive and cheap girls dresses, skirts, tops, and jackets. Also offers tall size teens jeans and pants in 35" inseams. Select Tall under the Women's section. Shop online or at retail locations. Based in the U.K.
Next ($) Tall size jeans, pants, and trousers in 35" inseams. Also carries tall girl dresses, skirts, tops, dress shirts, sweaters, jackets, businesswear, activewear, and sleepwear. Select Tall under the Women's section. Based in the U.K.
Old Navy ($) Inexpensive and cheap junior fashion dresses, skirts, tops, tees, tanks, shorts, jackets, and activewear in tall sizes. Also offers tall teen girls junior jeans and pants in long (34" inseam) and tall (36" inseam). Shop by inseam. Shop online or at retail locations. 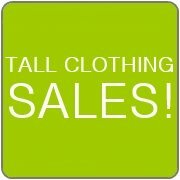 Tallgirls ($$) Specializes in clothes for tall women. Tall teen jeans and trousers in 34", 36", and 38" inseams. Also carries tall juniors dresses, skirts, tops, tees, sweaters, jackets, activewear, sleepwear, and swimwear. Based in the U.K.
Top Shop ($$) Trendy collections. Long length jeans in 36" inseams. Trousers and leggings in 35" inseams. Also carries tall girl dresses, skirts, tops, and jackets. See the Tall section. Shop online or at retail locations. Based in the U.K.